The main ingredients used in this dog biscuit recipe include oats, pumpkin seeds, blueberries, and chamomile. They are all natural and healthy ingredients for dogs. 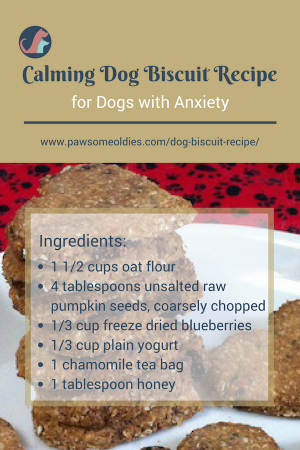 In particular, chamomile has calming effects so this biscuit is especially good for dogs who tend to have anxiety, are high-strung or overly active. Does your pawsome oldie have anxiety issues? Is your dog having a hard time calming and settling down? Anxiety in old dogs is not unusual, and there are quite a few possible reasons why they may behave the way they do. If you cannot pinpoint the underlying cause and the dog’s condition is getting worse, be sure to take him to the vet. Sometimes there might be a health issue that’s causing the anxiety. If your dog is otherwise healthy but is getting a bit skittish at times, use whole foods and natural remedies to help him. What better way to help your anxious oldie than to give him yummy biscuits? 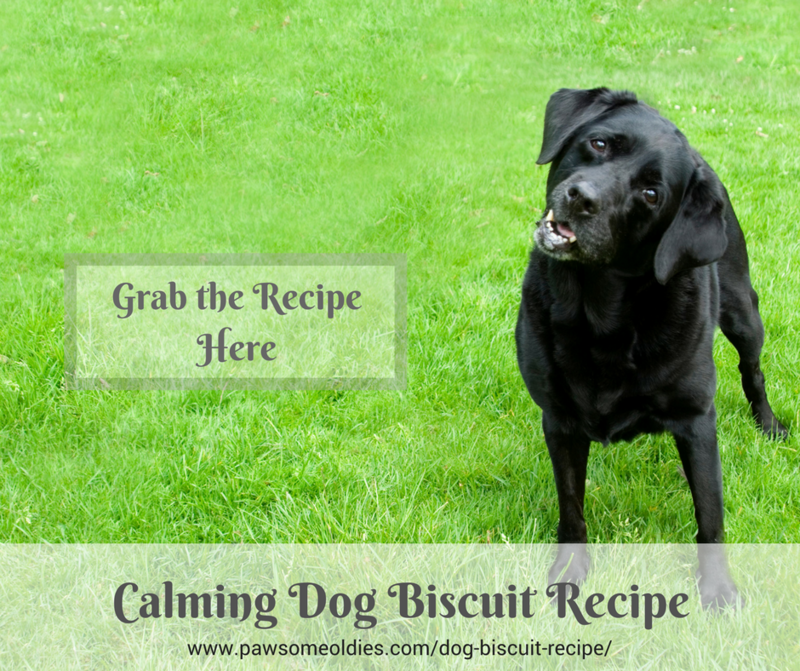 I used to make these calming biscuits for my oldie, Hana, and she totally loved them. Not one hundred percent sure if it was because of the biscuits, but she was the calmest, most laid-back oldie I have ever been with! What’s so good about this dog biscuit recipe? Well, as a start, it is low in fat, high in dietary fiber, and trace minerals (e.g. phosphorus and selenium). All the ingredients that I choose for this recipe are healthy, have antioxidative properties, and/or calming effect. Oats are rich in fiber, which slows down digestion rate and enhances the absorption of, amongst other things, tryptophan. Tryptophan is an amino acid essential for the production of serotonin (nature’s very own anti-depressant). For this reason, oats are commonly used by holistic vets to help dogs with anxiety issues, or those who tend to be hyperactive or just can’t seem to settle down. We all know that this herb has calming, stress-reducing, and relaxing effects. Having a cup of chamomile tea before bedtime can make you sleep better! But did you know that chamomile has other additional amazing health benefits to offer? For example, certain compounds in chamomile have strong antibacterial properties, so chamomile is good for boosting the immune system by helping the body fight infections. Blueberries contain a lot vitamins, minerals and antioxidants, all of which help protect the body from stress. They contain vitamin E, L-tryptophan and glutamate. Glutamate is required in the synthesis of GABA, an anti-stress neuro-chemical. Pumpkin seeds also contain selenium, the deficiency of which can lead to increased anxiety, depression and fatigue. Don’t know about you, but I would certainly reach for one of these biscuits if I had stress and/or anxiety! And the good news is, this is a super easy recipe. In a large bowl, mix oat flour and pumpkin seeds. Open a chamomile teabag and add content to the oat mixture. Knead a few times until you have a dough ball. Add more water if dough is too dry. Put cut-out biscuits onto the baking sheet and bake in preheated oven for about 25-30 minutes. Make sure that the chamomile teabag contains only the herb chamomile. Fresh or frozen blueberries can also be used. Be sure to thaw out the frozen berries first! If fresh or frozen berries are used, you may need adjust the amount of flour (add more) or yogurt (add less). Instead of honey, blackstrap molasses can be used.